Hello! I have been quiet on my blog over the past few weeks because my health has made keeping up with uni work a little tricky, so I had to prioritise my time. But today I am having a cheeky little Sunday morning lie in because I woke up earlier than usual, so I thought why not write a post before I start my uni work for the day?! I will try very hard to not let my blog posts slip again, and next month the uni year will be finished (Australia’s school/uni year goes from March to November), so I will be free as a bird to write posts! 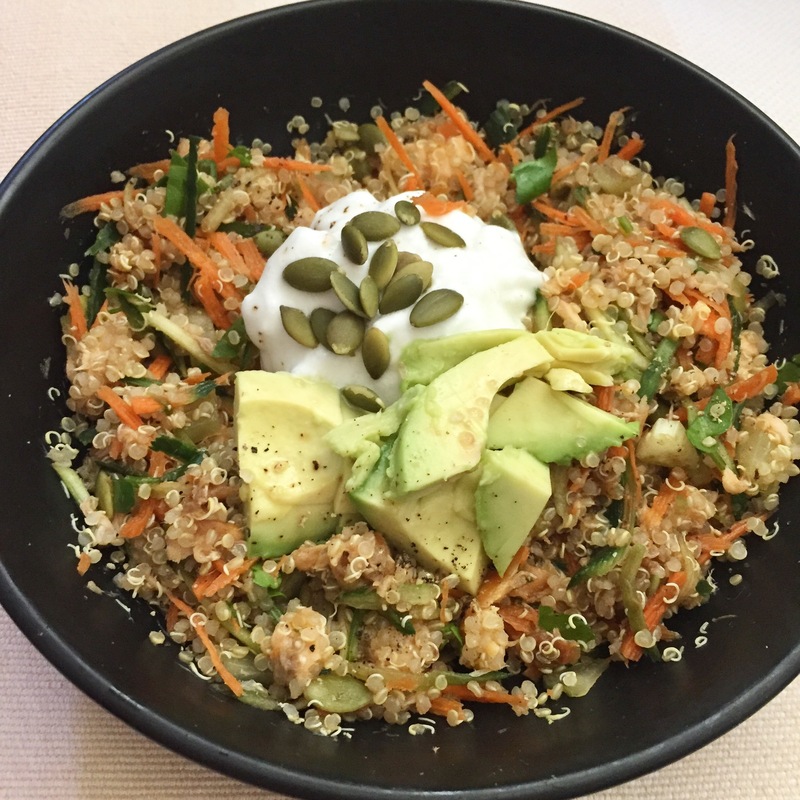 Today I want to share with you an amazingly delicious and healthy salad that I created this week and have eaten for several meals already because it is so yummy and has made me feel so good for hours afterwards. It’s the kind of meal that is so easy to throw together when you’re busy and keeps you full for hours. It is also great because you can chop and change the ingredients depending on what is in your fridge and what your favourite vegetables are. I haven’t put amounts in because it really is up to you and your taste buds as to how much you put in. I do suggest to make at least 2-3 serves of quinoa (as per packet instructions) when you cook it because then you will have plenty for leftovers for the next few days. If you do this, I advise you scoop out how much quinoa you want for one meal and add in the other ingredients to that amount, and put in the fresh ingredients again next time you want to use more of the quinoa. You definitely could make it all up in one go, but it’s nice to have fresh ingredients each time. 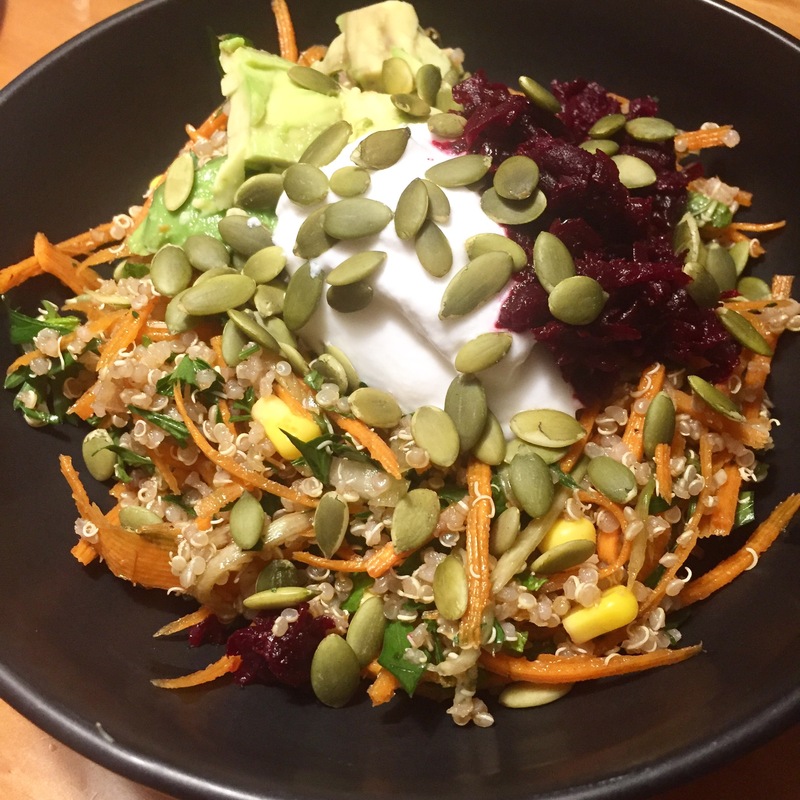 You could also do what I have done this week and make even more quinoa so that you can make my Ultimate Bowl of Goodness (which you can find with this link) for your breakfast over the next few days too! Thinly grate the carrots and cucumber. Chop up the mint and parsley. Place all into a bowl with the corn and pumpkin seeds. Pour in about 1/2 tablespoon of balsamic vinegar, a large squeeze of lime juice, and season with salt and pepper. Gently stir the mixture together. Have a taste and add in more vinegar, lime juice, salt or pepper depending on what you like. If you aren’t vegetarian, you could add your favourite tinned or hot smoked fish, chicken etc. If you have made a large amount for leftovers, scoop out the amount you want for this meal, and add a dollop of yogurt and sliced avocado on the top. Add the beetroot relish (optional). Garnish with some more pumpkin seeds, parsley, mint, salt and pepper if you want to. Add all the ingredients into a saucepan and bring to the boil on a high heat. Keep stirring. Reduce to a low heat and simmer for 1 – 1 .5 hours or until the beetroot is soft and most of the liquid has evaporated. It is important to stir it now and again to keep it from catching at the bottom of the pan (you don’t want bitter pieces of beetroot in your relish!). When it is cooked, adjust the seasoning to your preference. You can leave it a bit chunky if you like, or mash it with a fork to make it smoother. You could even blend it if you wanted it really smooth. I hope you enjoy it! Please let me know in the comments if you make it and what you think.